In the digital age of automation, where repetitive routines are performed by machines and letting man-power to do more intelligent tasks, Microsoft introduced Microsoft Flow that helps this cause. Microsoft Flow is a cloud based service introduced in Office 365 that provides workflow management to integrate and automate different tasks across more than 85 applications. It allows users to create workflows that automates time-consuming tasks like approvals, send/receive notifications, collect/update data and synchronize files. Microsoft Flow can tighten the gap between various predefined Microsoft/Non-Microsoft applications like Dynamics 365, Sharepoint, Twitter, One Drive, Slack and many more. Microsoft Flow allows users to react to those triggers from one application and perform some task in another application using it’s data and that too with zero coding knowledge. A nice example would be “When a file is added on SharePoint Online, send an Email notification”. After setting up the Trigger, you can either put a condition, perform an Action or even apply a loop to perform actions. There are also many predefined templates available, where you can choose according to your business requirement. Just like other various apps, Microsoft Dynamics 365 can very much benefit from Microsoft Flow. There are numerous scenarios and applications that can use this automation process and simplify the integration with Dynamics 365. We will show you an example to fully understand Microsoft Flow and it’s applications with Microsoft Dynamics 365. Scenerio: Attach OneDrive’s files related to Account as Notes to respective Account if Filename starts with Account Name. 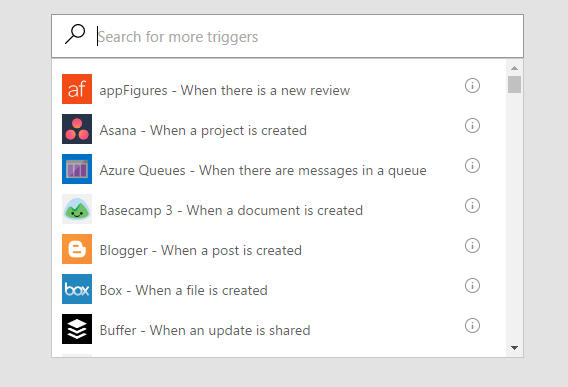 Trigger: When files is created in OneDrive. 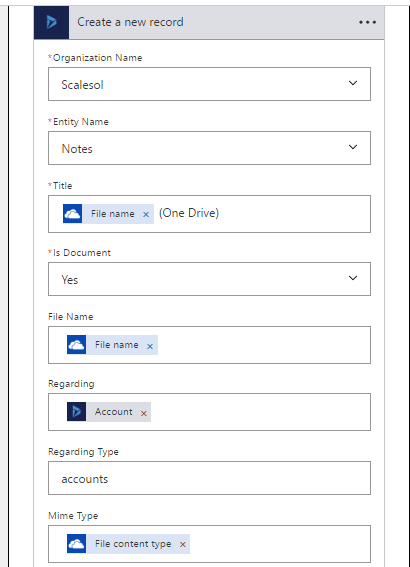 Action: Create a Note’s record in Dynamics 365. 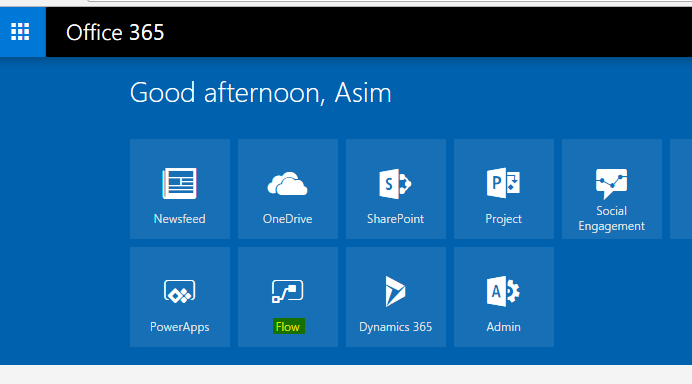 Log-in to your Office 365 account and click on Flow. Under My Flow menu, click on Create from Blank on top right corner. 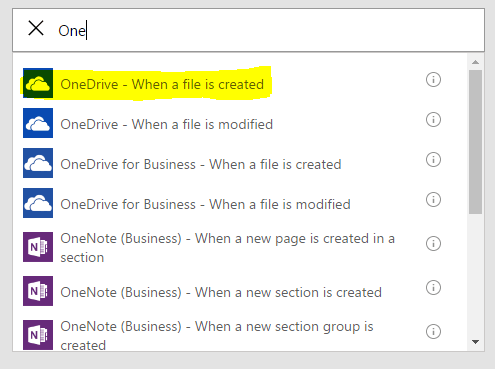 Select the “OneDrive – When a file is created” trigger from the list. You may need to sign-in from OneDrive account and authorize Microsoft Flow. Select the OneDrive’s folder you want to associate with the trigger. Flow will only fire, if new file is added/created in that folder. 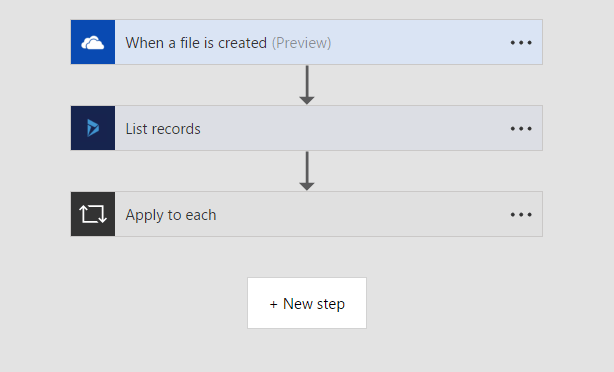 After selecting folder click on New Step > Add an Action. 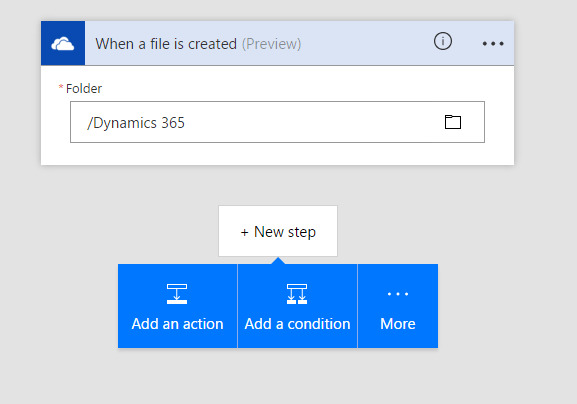 After setting up the trigger, we need to list all the “Accounts” record from Dynamics 365 so we can put the condition and retrieve the related Account record for the uploaded file. 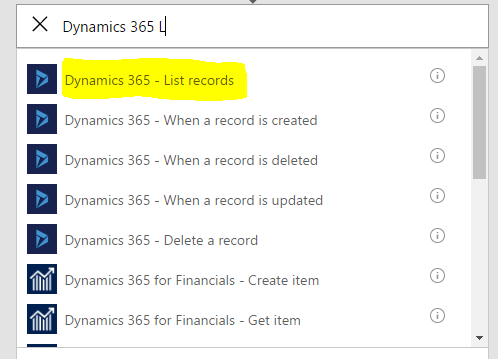 For this select “Dynamics 365 – List Records” from the Action’s list. 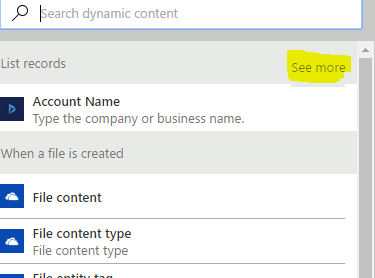 Specify the Dynamics 365’s organization name and Accounts as entity name. Click on Add a condition. Set the condition as shown in screenshot. It will filter the records from Accounts that are related to that file. You can perform action on both condition fulfilled and condition failed, by default it is set as DO NOTHING. File name and Account Name in the above screenshot are dynamics content resulted either from triggers or Actions. Click on see more if your required field is not listed. Under IF YES section of the condition tab, click on Add an action. 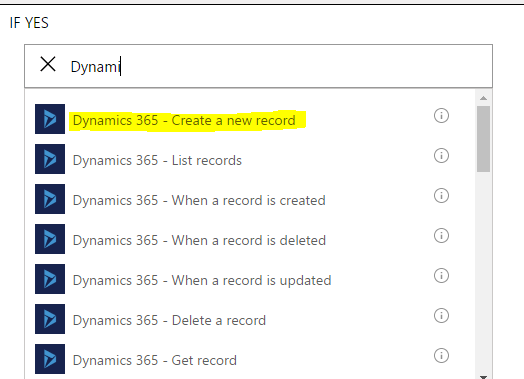 Select Dynamics 365 – Create a record from the list. Select your Organization Name and other related fields as seen in screenshot below. Congratulations, you have made your first flow, now it’s time to test it. 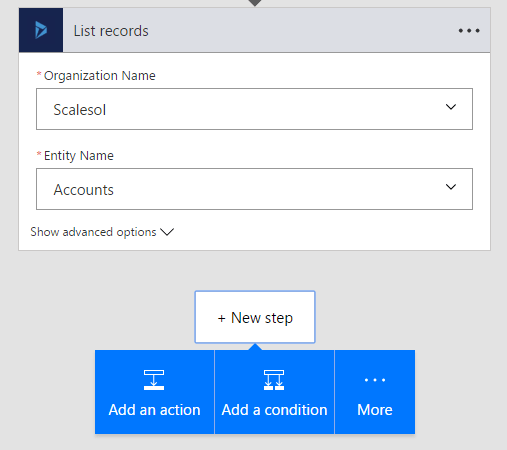 Create an Account’s record in Dynamics 365. Upload/Create a file in OneDrive, have a name that starts with that Account’s name. Open that Account’s record and a Note’s record with the uploaded file as attachment will be waiting for you. If you don’t see that record at once, then have some patience and recheck after some time. Microsoft Flow is a great addition in Microsoft family. With the slogan of Work Less Do More it really saves time and helps you automate the processes without having a proper coding knowledge.